Along with other migratory birds, the hummingbirds have also flown south from North America to warmer winter homes in the Caribbean and Latin America. Instead of good-bye, let's say hello to this group of tiny but gorgeous group of avian acrobats. While they are found only in the Americas, there are more than 300 species of them; only 12 migrate to North America each year. They migrate north for the plentiful food, in the form of insects and flower nectar, that pops up in northern climates every spring. #1: Their long bills: One of the main purposes of a hummingbird’s bill is to help them probe deep into the flowers for specialized feeding. 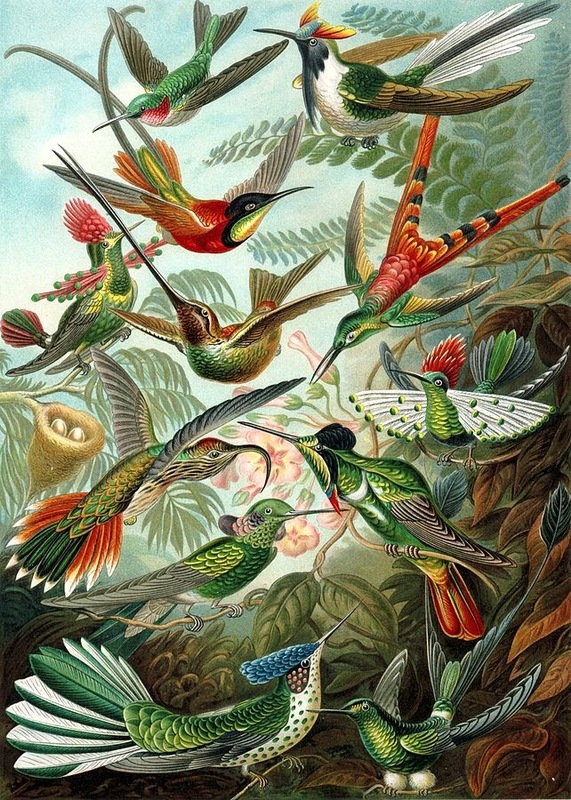 The shapes of various hummingbird bills have evolved over time. 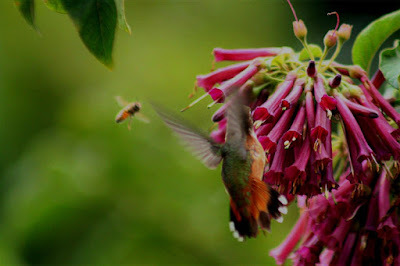 Once they’ve placed their bill in the flower or hummingbird feeder, they use their tongue to lab up the nectar. And their tongues are fast, licking as much as fifteen times per second. just as the long, straight bills of other species reach nectar in long, straight flowers. 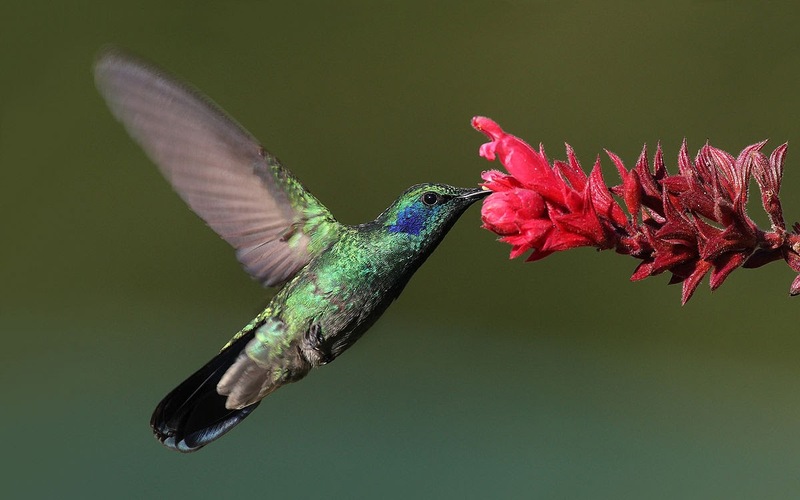 #2: Their heavy bills: Some hummingbirds have such a heavy beaks, that when they perch to rest, they hold their beak straight up in the air for balance. #3: They're tiny! 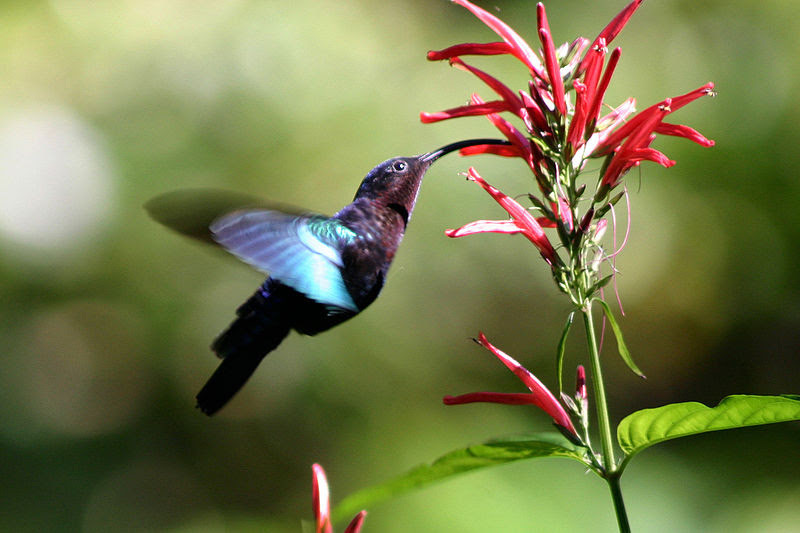 Most species of hummingbirds will weigh less than 4 grams. To put it in perspective, one teaspoon of sugar weighs 4.2 grams. #4: They're hungry! Hummingbirds eat half of their weight in nectar a day. They also like to take in protein by eating small (obviously) insects and spiders. A green violetear drinking (slurping!) nectar in Panama. 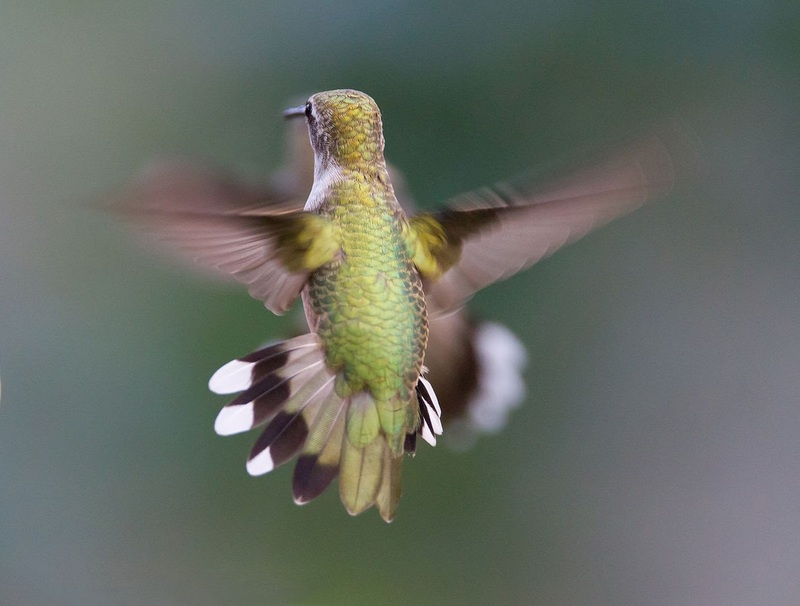 #5: They hum: It’s no surprise that hummingbirds get their name because of the humming sound their wings make, but did you know that each species of birds makes a different hum noise with their wings? This is because they each have a different rate of speed in which they flap their wings. #6: They're not picky about colors. They frequent the flowers with the most nectar, and they remember these. Happily for hummers, bees and other insects don’t see the color red as well. Many hummingbird feeders are red because they are harder for bees to spot, thus making it a more pleasant place for the hummingbirds to eat. When bees do find the red feeder, if you move it 3-4 feet (1m) away, the hummers will find it, but the bees won’t know where their nectar went. #7: They are secretly helicopters: The hummingbird’s wings work in figure 8 movements giving them the ability to fly backwards, forwards, suspend themselves in mid-air and fly upside down. #8: They are speed demons: Hummingbirds can also travel at 50 kph (30 mph) when flying horizontally and can reach up to 100 kph (60 mph) when they dive vertically. #9: They don't walk: Nevertheless, the feet of hummingbirds are too small for the birds to walk on them, but they can move from side to side on the perch. These little feet won’t add extra weight that can slow them down when in flight (see #8). #10: They nearly hibernate. Every day. : At night, hummingbirds slow down their metabolism by going into torpor, which is similar to hibernation. Since they can't keep feeding while they sleep, this deep sleep that they go into helps keep their energy levels from dropping to dangerous levels. Hummingbirds are more than just fast-feeding, fast-flying fiends, though: they are tough in more ways than one, so more hummer facts coming soon! it was so much fun to read about all the facts of these hummingbirds. the colors they have on their body are so eyecatching and beautiful.